While I Was Away: Royals, Cannes, Etc. Stuck this week in Internet hell, I barely had time to post. While I was basking in off-gridness, television continued to serve up specials on Harry and Meghan. The most egregious have been on PBS, with Meredith Viera hosting. I say egregious because the level of host banter has been not even sub-par. PBS should be giving us some serious royal history — replete with bad behavior — instead all this gushing tosh. Shame on the network for stooping so low. At Cannes, Lars von Trier‘s “The House That Jack Built” premiered. All the negative reviews — the movie’s too long, too mired in gore, too messy — only made me want to see it more. 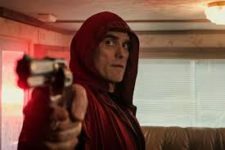 Matt Dillon as a philosophical serial killer!